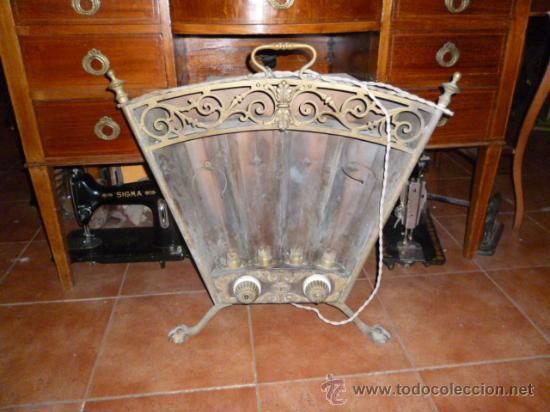 ESTUFA ELÉCTRICA MUY ANTIGUA. ES DE COBRE Y BRONCE, CON LOS INTERRUPTORES DE PORCELANA BLANCA. LLEVABA UNAS BOMBILLAS MUY GRANDES SUJETADS ARRIBA POR UNOS SOPORTES, DE LOS CUALES FALTAN ALGUNOS, PUEDE APRECIARSE ENL A FOTOGRAFÍA, QUE UNO DE ESOS SOPORTES ESTÁ APOYADO ABAJO, ALREDEDOR DE UN CASQUILLO. LAS BOMBILLAS ERAN DE BAYESTA, HACE FALTA TRANSFORMADOR PARA ENCHUFARLO. ES UNA BELLEZA. MIDE 65 X 65 X 12 CM MÁS 17 DMÁS DE FONDO DE LAS PATAS POR DETRÁS Y UNOS 6 CM MÁS POR DELANTE, DE LAS GARRAS. Hora oficial TC: 14:18:34 TR: 81 ms.